Viator offers tourists an easy way to skip the line at the Uffizi Gallery and maximize their time in Florence. The lines at popular museums and tourist attractions in Florence can be formidable, especially during peak travel periods. Travelers over the age of 50 realize that time is one of their most precious commodities—and having to wait on long queues to visit a museum, particularly in oppressive weather, hot or cold–can potentially rob them of both the time and stamina to explore the vast holdings of the museum. 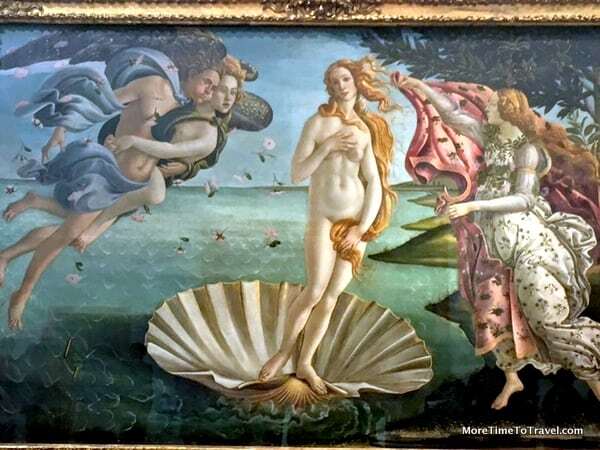 Before leaving home, we learned we could purchase “Skip the Line” Uffizi vouchers online from Viator (an online tour and activity booking agency that is part of TripAdvisor) at a cost of €28 per person. We booked tickets for a specific date and time that fit in with our itinerary. Upon arriving at the museum, we were instructed to meet a local tour operator on Line 1, just outside the entrance. She exchanged our Viator vouchers for tickets that allowed us to walk directly into the museum without a wait—rather than face the uncertainty of whether or when we could get in. Many visitors report waits of an hour or two without these tickets. The Uffizi Gallery, designed by Giorgio Vasari, is one of the oldest museums in the western world. Built between 1560 and 1580, it holds 1500 pieces of art. Its masterpieces represent one of the best collections of Renaissance art. It also has an impressive collection of statues and busts of the Medici family as well as paintings by German, Dutch and Flemish painters. The two-floor U-shaped building is relatively easy to tour because the works are arranged chronologically, all clearly labeled in both Italian and English. Additionally, once inside the museum, visitors can purchase headphones for a self-guided audio tour or a written guidebook. About 2-3 hours is sufficient for a cursory visit. In addition to the wonderful sculptures and paintings—many of which are so famous they are immediately recognizable—the views from the Gallery’s windows are simply breathtaking. For a mid-visit break, order an espresso or café crema at the rooftop café and soak in the panoramic views of the surrounding city sites. When we were in Perugia, we learned that in an international competition, the Italian Minister of Culture and Tourism recently selected 20 new directors to replace the current ones at the country’s most important museums. Apropos of that competition, Eike Schmidt, a German art historian, was named the new director of the Uffizi and the museum has a temporary website, which is being revamped. Like most museums, you exit through a series of gift shops but if you buy a postcard at this one, you’ll be able to mail it at the Post Office located just at the museum’s exit. We highly recommend checking out the Viator Skip the Line Tour next time you plan to be in Florence! The Uffizi Gallery is closed on Mondays and on January 1, May 1 and December 25. Regular price entry tickets are €8 per person and €4 additional to pre-book by phone. Visitors under 18 are admitted free. On the first Sundays of each month, admission is free to everyone. Visitors are allowed to take photographs inside the museum. If you arrive in Florence by car, be sure to come early to park at one of the public underground lots in the city. Parcheggio Beccaria is an easy 20-minute walk to the Uffizi Gallery along the picturesque banks of the Arno River. I (Janice) adore Botticelli. As a university student, I had a huge framed print of his Venus on my dorm wall. Definitely one of my favorite Renaissance painters, too! Viator is a terrific travel tool for solo booking tours. We want to recommend also toursbylocals.com. Some of our travelers have used that group for insightful safe private tours in unusual places. Thanks as usual Irene.